We know that the lich performed the rite of desecration to halt the destruction of the forest so we could try to symbolise how the landscape changed as the kingdoms of men spread. Starting in the East we have our first kingdom. This one is closest to Titan’s Gate, on the fringes of the forest. I imagine this kingdom would have had the best chance of clearing the most land before the kingdoms fell, it’s also served by three rivers. The gold and green check represents the verdant pastures (green) and abundant crops (gold). It’s also distinct from the other kingdoms so far, we haven’t use chequy anywhere else. I loved the idea of arrows or daggers intertwined with tree trunks. It could represent conflict with the forest itself as the people of the kingdom carved out their domain, or their prowess as hunters. Or maybe there’s an old folk tale of the first king of these lands who blooded three arrows and fired each to mark the bounds of his kingdom, the land feared his reach would be too far and give him dominion over the whole world so a great forest sprung up and trapped his arrows and that’s where the forest first came from. But, ultimately I decided this was too fiddly a device for one of the main kingdoms. I liked the idea of including a weapon (as none of the human kingdoms do yet) so I figured three swords worked. As the southern kingdom’s capital is near(ish) to the coast the blue field works, and with the marsh to the North and the goliath to the East I figure they would have had plenty of groups to fight. Finally we have the kingdom to the North. These guys are closest to the lich’s island, I reckon they would have had to carve their lands from the thickest, darkest forest. My first thought was an axe but we’ve already got blades for the kingdom to the south and axes evoke some of our dwarven kingdoms so my next thought was fire. We haven’t used rayonny anywhere else and they’re the only human kingdom using red so they’re still distinct. I went for the flames moving across rather than burning up or down to give them feel that they are crawling across the shield much as the flames of men would’ve burned across the land. Objectively the best inhabitants of Collabris: The Dragonmen of Zir. Arabic (Fremen) Dragonborn of the desert. Civilized, not nomadic…Capital city: Ziris, the Glass City, the Shining Star of the Sand. Literally made of stone and glass. A democracy where only and all wizards can vote, the Grand Vizir is elected by the Council of Seven, the leading wizards from each school of magic. Geometry and calligraphic knotwork have to be our touchpoints here. I couldn’t decide whether this should be simple or intricate so I’ve ended up with a bunch of ideas. They’re all based around symbols that have a rotational symmetry order of 10 (to represent the 5 chromatic and 5 metallic dragon colours). This also has the neat touch that it’s made of two five-sided figures interwoven: the chromatic and metallic joined in a single nation. I quite like this mandala (to be honest I picture all of these getting used in one way or another! ), you could emphasise the knotwork, or perhaps groups of dragons pick out one of the figures to highlight? I’ve largely avoided colour in these designs. I picture the men of Zir using yellow (sand), white (glass) and red (fire) primarily but when you’re using 10 spoked figures the temptation is to try to include all the colours and metals which can end up looking disjointed. If you rotate it 180 you can see it’s a Z, an R, and the tittle from the i with an extra fork added to the Z to as a forked tongue or tail. I quite like everything here! And I think you could combine pretty much any of them and they’d work together. Ruled by Queen Aeleth, Ardenia is famous for its bardic college: the College of the Whispered Song (aka The Whisper) led by Master Troubadour Cristoph. 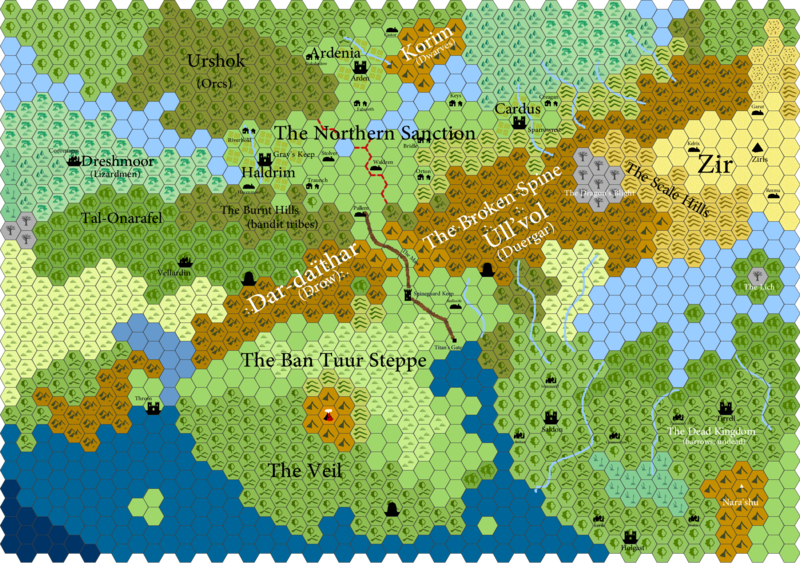 Ardenia’s bards travel the kingdoms from the high city of [I dunno what] all the way to Titan’s Gate, collecting and spreading news! Suspected by the other nations, but never proven, Queen Aeleth uses her bardic college as a spy network keeping the larger, more prosperous kingdoms of Haldrim and Cardus at bay. A starling seems a good fit. A flock of starlings is a murmuration and the collected bards are knows as The Whisper; murmur/whisper works for me. Even the most commonplace are decked out in a shining coat of stars (which seems to befit a bard), and some can be pretty stunning. I also took inspiration from a personal favourite heraldic bird: the martlet. A martlet is a swift or swallow depicted without feet, often (but not always) used to represent to represent fourth sons. There’s a poetic explanation that as the fourth son they won’t inherit land or title nor will they join the priesthood so instead are sent out as landless wanderers to make their own fortunes. Whether or not that’s true I don’t know but I like the idea that it symbolises the Bards of the Whispered Song as ever-moving. In slightly sad related news, while I was working on this my cats found a baby bird that had fallen out of its nest :( He didn’t seem hurt, but no idea where the nest is so I’m hoping ma and pa pigeon manage to find baby bird in my garden. Time to talk about some very naughty dwarfses. The upper, civilized, kingdom of the Duergar. The lower kingdom Ull’vok fell years ago and the Duergar there went mad and became the Derro. Duergar are often cast as slavers and my initial idea was to try something with a whip (think cat rather than Indy) as their symbol and see if the negative space of the fan of tails could represent the peaks rising up above their empire. Ultimately I felt these ended up too fiddly, the fan either looked too much like a radiant sun (something the gray dwarves are not so keen on) or it was too complex, not strong enough. I still like the idea of a whip, I might return to it as a symbol of their god of nightmares. My next thought was something using chains or manacles but I want House Argentum to have the fancy knotwork. Instead I decided to pare it right down, keep it simple, strong and recognisable: bars. I like the right hand option as a symbol of the Hierophant. My old arm injury flared up again last week. I’m not entirely sure why as I tend to work exclusively left-handed at the office but there you go. Perhaps my right shoulder is writhing in fear, sympathetic to the punishment the Summer holds for its sibling. So I took a week off drawing anything and tried to avoid using devices outside the office which has helped. I missed the world-building stream last night but I’m planning to listen to it at work today and I should be devising devices once more before the week is out. If you’ve been keeping track you can read the up-to-date pdf here and view the full map here. Matt is going to continue work on the project and commission some artwork but even without that there’s a great world here that people are already using. Pretty frickin cool.